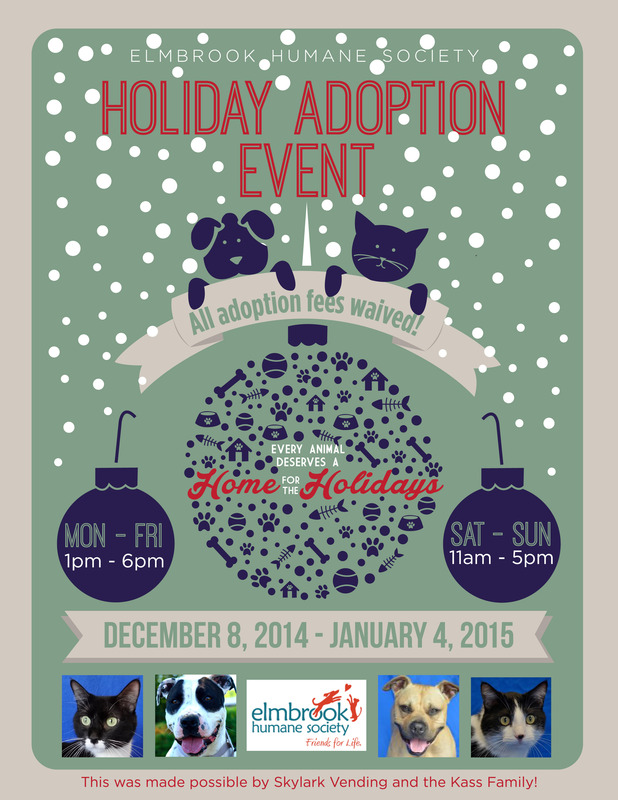 Through January 4, 2015, Elmbrook Humane Society (EBHS) is waiving all adoption fees. Last week, two local organizations, Milwaukee Area Domestic Animal Care and Control Commission and Wisconsin Humane Society, announced a similar promotion thanks to a gift by Skylark Vending. Wanting to impact the lives of as many animals and people as possible through pet adoption this holiday season, Skylark Vending and the Kass Family extended their generosity by making a gift to EBHS to sponsor the adoption fees of all animals in their care. “This is a fantastic opportunity to enrich your life through adoption,” shared Heather Gehrke, Executive Director. “Through this gift by the Kass Family, you have an opportunity to forgo the adoption fee which allows you the opportunity to invest the money saved for other needs such as training, care, and supplies,” Heather went on to explain. Realizing not every home is in a position to add a pet during the holidays, adoption fees will be waived into the first part of 2015. “It is our goal to ensure that homes add pets to their lives when the time is best for everyone and for some, the holidays are very busy,” shared Heather. EBHS asks anyone considering adding a furry or feathered friend to their life, to stop in and meet with an adoption counselor to explore if your next family member is at EBHS waiting to be found. EBHS adoption counselors are excited to help make great matches so that as many cats, dogs, and small animals in need find a new home this holiday season that showers them with love and attention and in return, you will find a faithful and loving companion! EBHS is open from 1pm – 6pm Monday thru Friday and 11am – 5pm Saturday and Sunday; EBHS will be closed Christmas Eve, Christmas Day, and New Year’s Day. For more information on adoption and to view pets available for adoption at EBHS, visit http://www.ebhs.org/index.php/adopt-2. The mission of Elmbrook Humane Society is to provide shelter for homeless animals, promote the human animal bond, and prevent animal cruelty and neglect. Elmbrook Humane Society is the only No Kill animal shelter in Waukesha County, serving the community since 1964. www.ebhs.org. 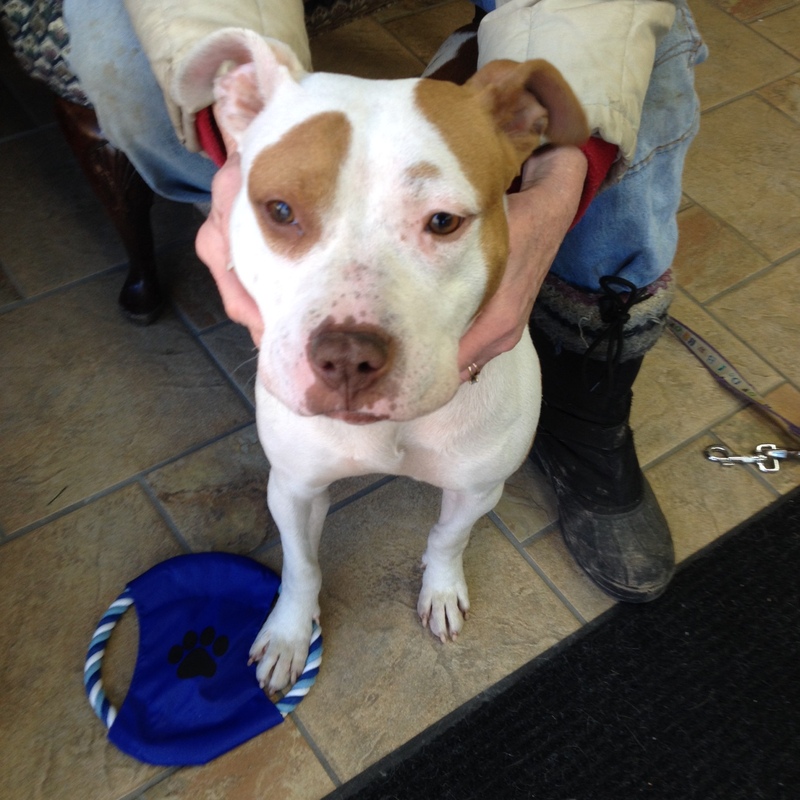 “Sylvie” is a rescued Pit Bull Mix, roughly 1.5 years of age. 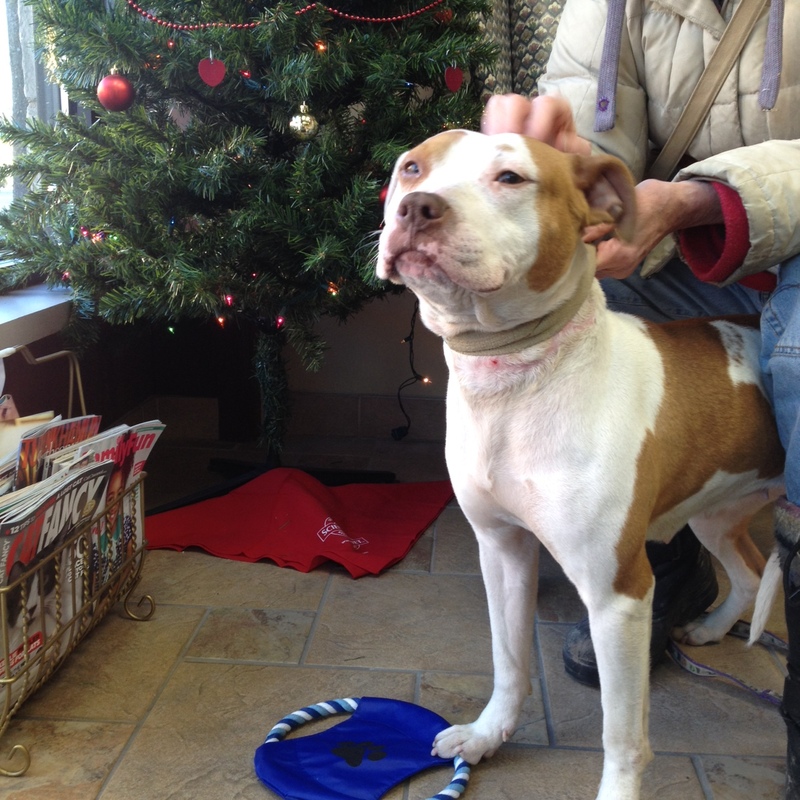 She is a red/white female discovered on the streets of Milwaukee. She had marks of bad tethering around her neck and may have been used for breeding and then tossed out. 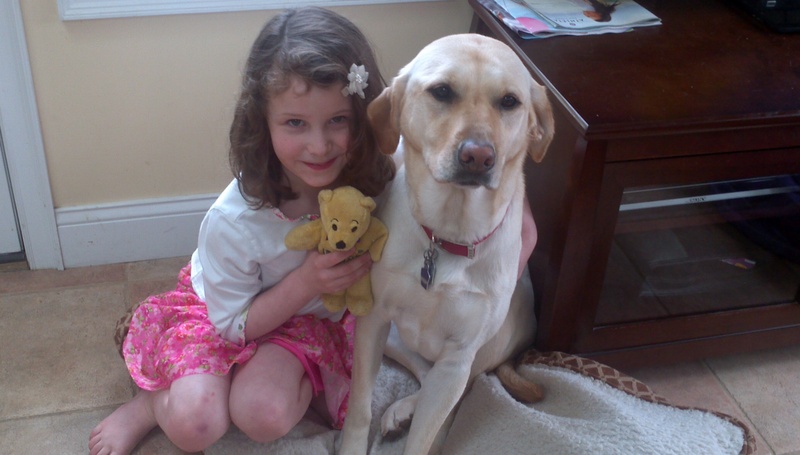 She is as loving as a “Golden Lab” and so gentle. She loves to sleep with her head on your lap. A small, negotiable adoption fee may apply and contract is required. Spaying will be including. Please call Lisa with you inquiries 414-445-4233! Former Green Bay Packer Joins Milwaukee Emergency Center for Animals and John Paul’s (PAWS) To Host Pet Pictures With Santa and The MECA Vest a K-9 Holiday Event! Greenfield, WI – December 2, 2014 The Milwaukee Emergency Center for Animals (MECA) announced today that former Green Bay Packer George Koonce will join them and John Paul’s (PAWS) Buick GMC to host the first ever “Pet Pictures with Santa” and “The MECA Vest a K-9 Holiday Event on Saturday, December 13th, from 1PM until 5PM at John Paul’s Buick GMC located 3615 S. 108th Street in Greenfield. George Koonce will meet and greet his fans and sign autographs from 1:30 – 2:30 at the event. The goal of the Holiday Event is to raise community and statewide awareness of the need for police K-9 protective vests, new police K-9’s and police K-9 total wellness which incorporates early veterinary care. The event will include free pet pictures with Santa courtesy of John Paul’s Buick GMC along with MECA’s K-9 police demonstrations, a silent auction, raffles and more! 100% of the proceeds will go towards the MECA Foundation. Just this past July, The MECA Vest a K-9 Fest entertained the largest number of attendees ever boasting over 1200 supporters including seven of the Milwaukee Brewers who have shown support for the cause since the MECA Vest A K-9 Fest’s inaugural event back in 2012. “Our police dogs are the first to risk their lives when they’re sent into harm’s way. They deserve the same protection our human officers receive,” stated Dr. Marla Lichtenberger, owner of MECA and the MECA Foundation. The event will be held on December 13th from 1PM – 5PM across from MECA at John Paul’s Buick GMC. If you love animals and would like to support the mission to help protect police K-9 officers from harm, you won’t want to miss this event. Any and all pets are welcome.